In my (cook)book, a salad for lunch has two criteria to meet: it has to be refreshing, and it’s gotta fill me up. The refreshing part is easy when you include fresh seasonal fruits and vegetables. Making it filling however, is where many fall short. Sure, a green salad is a great starter and palate cleanser, but lettuce, tomatoes and shredded carrots don’t cut it when it comes to keeping you satisfied. If you’re hungry an hour or two after enjoying your salad, you need to change what’s in it. The key is to make sure you toss ingredients that contain fiber and protein (and this should be true for all your meals and snacks). While fruits and vegetables are great sources of fiber, even contain a little protein, including beans and/or nuts in your salad will give you the extra boost of fiber and protein you need to stay fuller, longer. Adding a small dose of dietary fat, like the nuts, or avocados or hemp seeds, even a drizzle of olive oil, seals the satiety deal and aids in the absorption of fat-soluble vitamins. 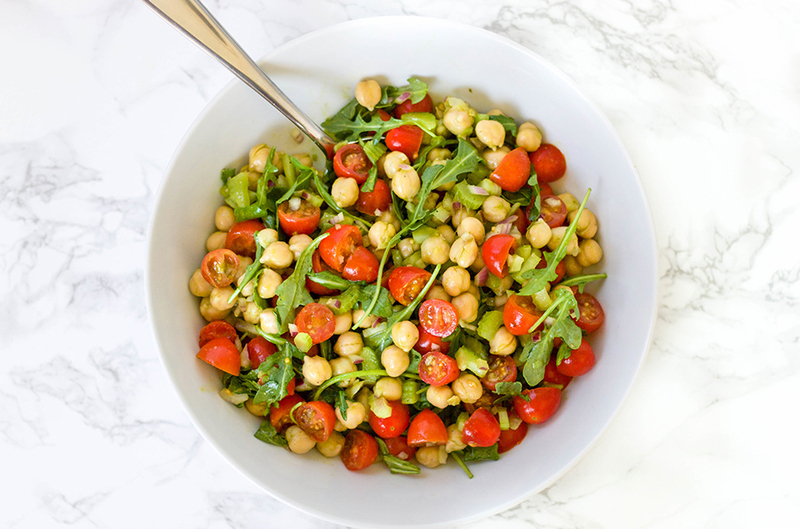 This chickpea, cherry tomato and arugula salad not only meets the refreshing and filling checklist, it’s also beautiful and delicious (these musts are a given). I’ve added a couple of stalks of thinly sliced celery for that essential crunch in a salad, while the slivers of red onion (green onion would be a nice substitution) adds mild onion flavor. If you find the red onion too pungent to eat fresh, try soaking onion slices in a cold water for about 10 minutes, and drain before using. Like all my recipes, this salad as a meal is easy to prep, so it’s the perfect go-to salad for a busy weekday lunch or al fresco dinner now that the evenings are cooling off. Finally, the mix is topped off with the final salad must: a fresh, homemade dressing. I love discovering a new, easy-to-prep dressing, and this basil vinaigrette is so good, it will now be a staple on everything from salads to grilled veggies and fish. This dressing recipe yields more than you’ll need for the salad. 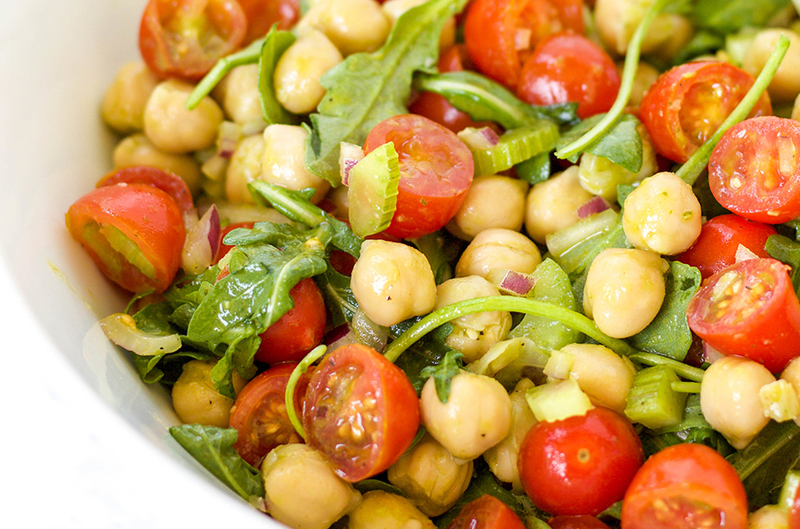 Drizzle slowly until you lightly coat the salad to your preference, but be sure not to overdress. Save the rest of the dressing for later – it will keep for up to a week. Slice cherry tomatoes in half and place in a colander, sprinkle with sea salt and allow juices to drain. Prepare the dressing by combining the garlic, basil, olive oil, vinegar, honey and salt in a small food processor or blender. 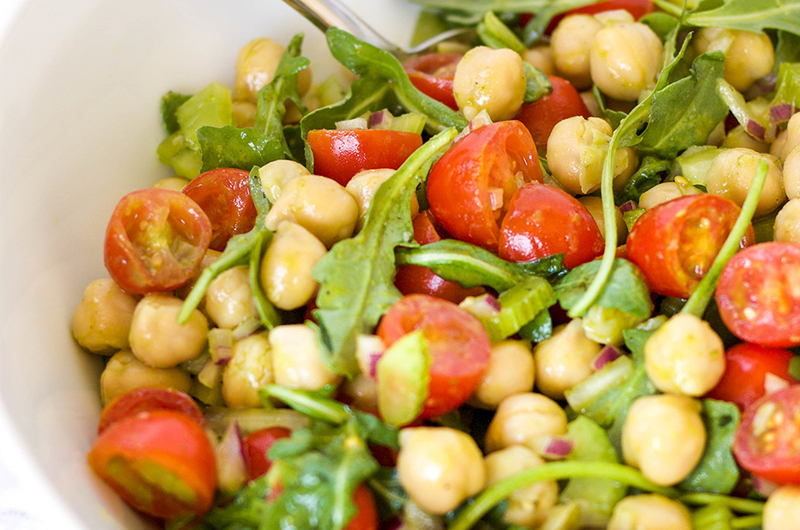 Place the arugula in a large serving bowl and gently fold in the beans and tomatoes and toss with the dressing (note: this recipe makes a larger batch of dressing than required; dress lightly and save the rest in the refrigerator, where it will keep for one week). This is a great dish for a potluck!